We’re the only arts and crafts shop in Camden Town so finding us should be easy! Strolling down Chalk Farm Road, you’ll find us seconds away from the legendary Roundhouse, on the opposite side of the street – just before the traffic lights towards the famous Camden markets. 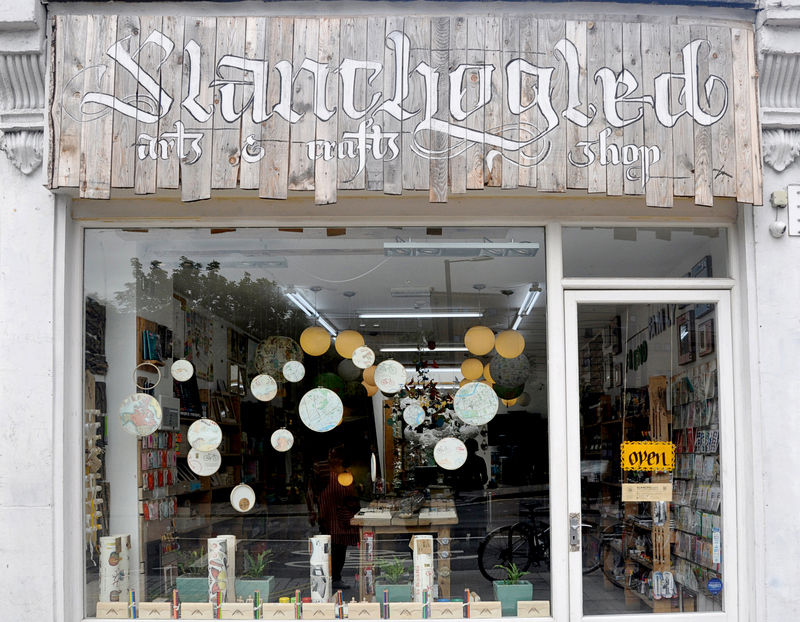 You’ll see a colourful window, a beautiful “Slanchogled” sign which you might have fun trying to read out loud, and there we are! You’ll walk straight into the ground floor of the shop, but remember to explore our lower level, also known among our customers as the “treasure trove” – it holds plenty more to discover and get you inspired! We’re open everyday come rain or shine between 10am and 6pm Monday to Saturday, and 11am to 6pm on Sundays. Me and my friend travelled down from the North West today, to explore London and we were hoping to find some sort of art shop (as we’re both Art students) – and so we did, but this wasn’t any old art and crafts shop, it was literally like walking into Aladdin’s Cave! we were absolutely amazed and we could’ve spend hours in there, but we had the rest of the city to explore yet. we were also certainly impressed with the total cost of the bits and pieces we’d bought, and the 15% student discount made it even better. I can safely say, in my opinion, that this is the best craft shop I’ve ever been to – everything was set out perfectly and the staff were friendly.. if only you were to expand your store further up the country so we wouldn’t’ve have to travel a long way! (although, it’s definitely worth it) I would definitely recommend this little shop for every keen craft-mad individual! thanks again! I just came to the shop hoping to shop from 10-10.30 and it’s only open at 11 on Sunday. Would recommend that you change the statement ‘We’re open everyday come rain or shine between 10am and 6pm’ on the website to avoid anyone else having a wasted journey! I’m very sorry that you found the wrong information on our blog and that the shop was closed when you came. Thank you for letting us know, I’ve made the changes. I like eclectic, and to be able to stand in a store with head going overdive is a pleasure. Wish they had |Christmas stock in now, but they dont apart from some ballbells. Last yeat, there were small ceramic Santas, penguins and so much more. Have already placed my name on the mailing list, yet to hear anything back. Hi, yes we’re still open, just a bit behind on our facebooking. That sounds really great, please feel free to come by the shop to ask us questions or take pictures if you want. Hello are you opened today? We are coming to london end of April this year. Coming from Vancouver Canada. Looking forward to seeing your store. Yesterday I visited your beautifully charming shop. I live a bit further to visit it regularly… I was wondering if you would consider to set up Instagram (or other social media) account to publish / share with your customers your new stock or other info. You’re absolutely right about the social media. We are actually working on our new website/ online shop at the moment and the plan is to open Instagram and re-launch our Facebook page once the new website is ready, so that all the products can be linked. It’s a long process but we hope to have the website up and running latest by mid 2018! Oh LOVELY!! I was in London visiting family summer 2016 and my lovely cousin took me to your store as she knows I’m a very serious student of many arts! I was so happy! You have a wonderful shop and I will definitely be back! I couldn’t remember the name of your shop and was just reorganizing my studio and found the receipt!!!! I have worked in a couple smal supply shops over here; I was particularly impressed with the variety of different streams you are able to cater to without your shop seeming crammed or overwhelming! And thank you also for the lovely reusable bag!! Cheers!! Thank you for your kind words Deneen 🙂 Hope to see you again soon!